With five vessels and about 265 men, Portuguese navigator Ferdinand Magellan sailed from SanlÃºcar de Barrameda on Sept. 20, 1519. Sighting the South American coast near Pernambuco, he searched for a suspected passage to the South Sea, finding the Strait of Magellan. On March 6, 1521, Magellan reached the Marianas and 10 days later the Philippines, where he was killed while supporting one group of natives against another. 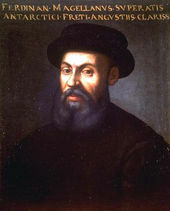 How many of Magellan's original crewmembers managed to return to Spain? Voodoo refers to W. African religious beliefs and practices that also have adherents in the New World. Voodoo believers are most numerous in Haiti and Benin, where they enjoy official government recognition. Voodoo contends that all of nature is controlled by spiritual forces which must be acknowledged and honored through offerings and animal sacrifice; ecstatic trances and magical practices play an important role in its ritual. Popular songs from what part of the US reference voodoo explicitly? Mengele was an SS officer and physician in the Nazi concentration camp Auschwitz. He supervised the selection of arriving transports of prisoners, determining who would be killed immediately and who would become a forced laborer, and performed experiments on camp inmates; these included placing subjects in pressure chambers, testing drugs on them, and freezing them to death. Those who survived the experiments were almost always killed for dissection. What became of Mengele after the war?